A. Švarc, Y. Wunderlich, H. Osmanović, M. Hadžimehmedović, R. Omerović, J. Stahov, V. Kashevarov, K. Nikonov, M. Ostrick, L. Tiator, and R. Workman. Unconstrained partial -wave amplitudes, obtained at discrete energies from fits to complete sets of eight independent observables, may be used to reconstruct reaction amplitudes. These partial-wave amplitudes do not vary smoothly with energy and are in principle nonunique. We demonstrate how this behavior can be ascribed to the continuum ambiguity. Starting from the spinless scattering case, we show how an unknown overall phase, depending on energy and angle, mixes the structures seen in the associated partial-wave amplitudes. This process is illustrated using a simple toy model. 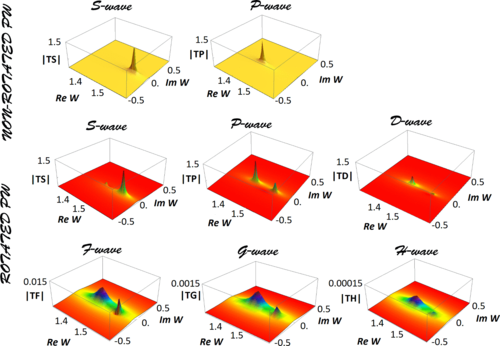 We then apply these principles to pseudoscalar meson photoproduction, showing how the above effect can be removed through a phase rotation, allowing a consistent comparison with model amplitudes. The effect of this phase ambiguity is also considered for Legendre expansions of experimental observables.